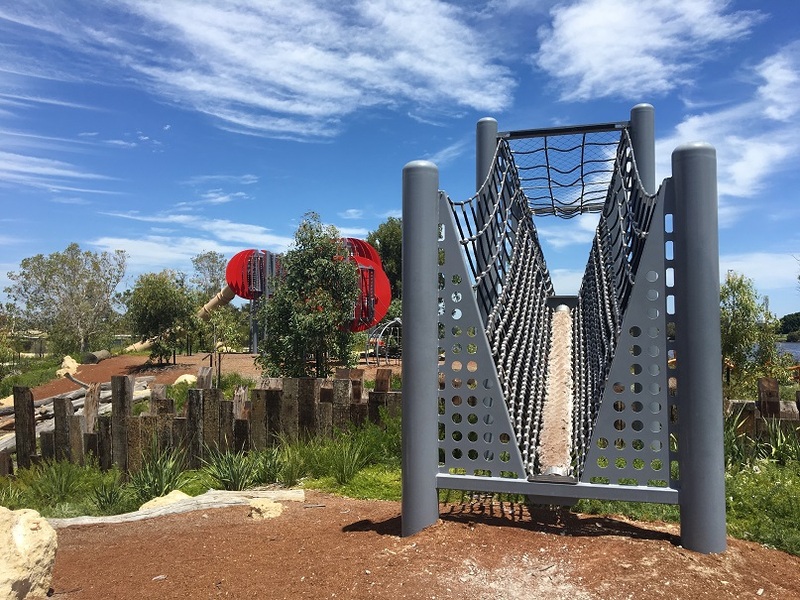 Chevron Parkland is overlooked by Optus (Perth) Stadium, is spread across 2.6 hectares of rehabilitated parklands and features several adventure and nature based play areas. You'll love exploring this unique natural environment that is rich in environmental and aboriginal culture. 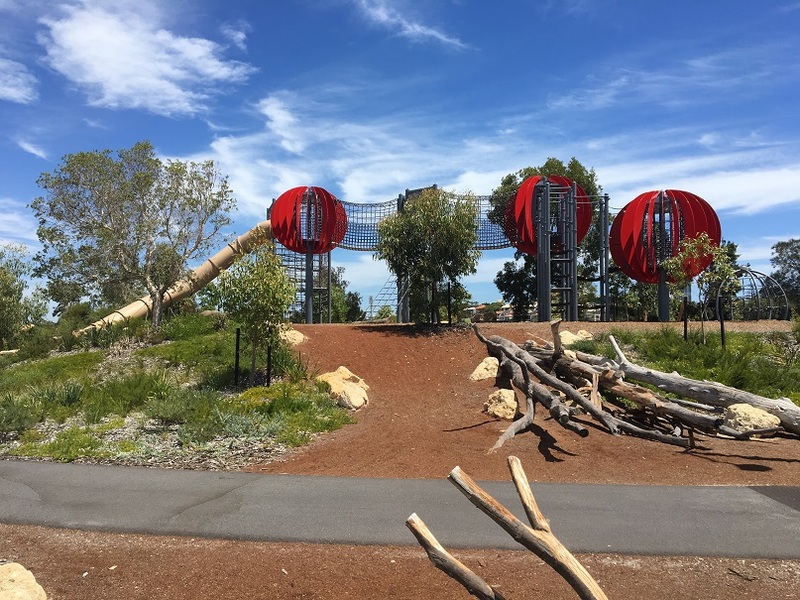 This play area is fully fenced and features a swing, nature based, musical and water play. Within the play area is a picnic shelter. 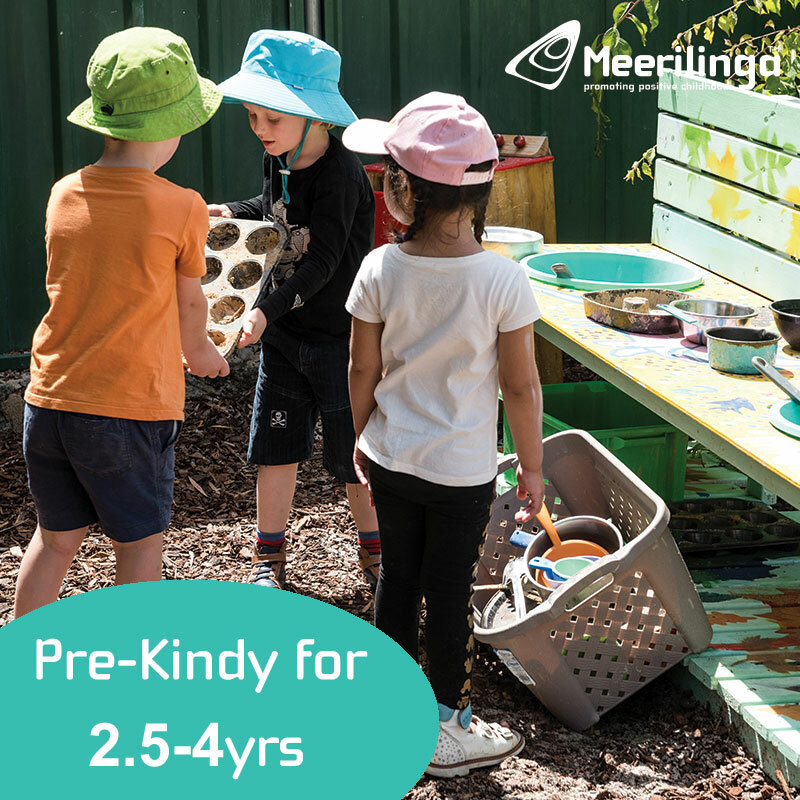 Kids are also challenged to find "emu eggs" that are scattered around the play area and count how many they can find. Make sure you bring spare clothes along to this one, the water play is popular especially on a hot day. 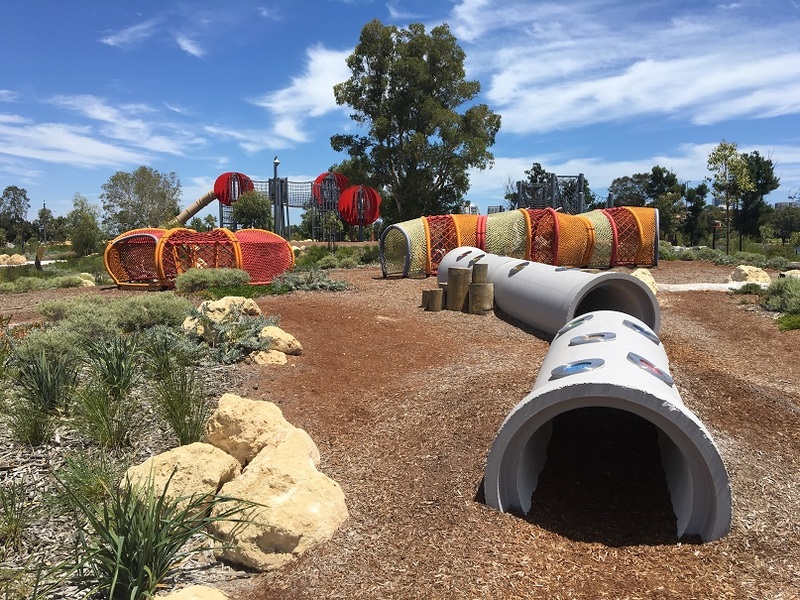 Of all the play areas this one is best for toddlers and preschoolers. 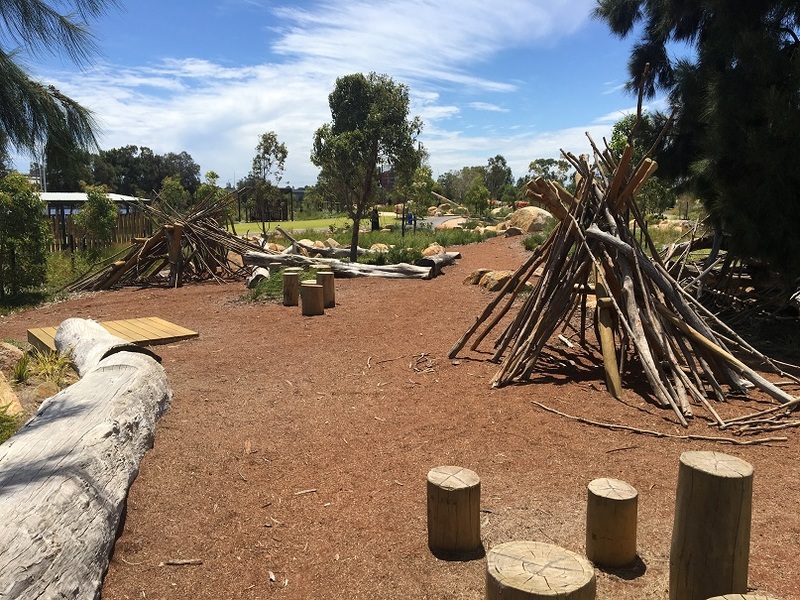 This area is predominantly nature play area with several teepess and branches for some serious cubby house building with lots of rocks and balancing logs here too. Here you will find the big red lookouts you can see when you drive past on the Graham Farmer Freeway. 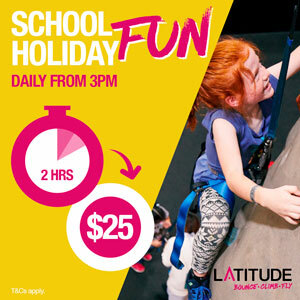 This is a great play area for bigger kids with rope climb access to the lookouts and rope bridge with a big enclosed slide, back to the bottom. 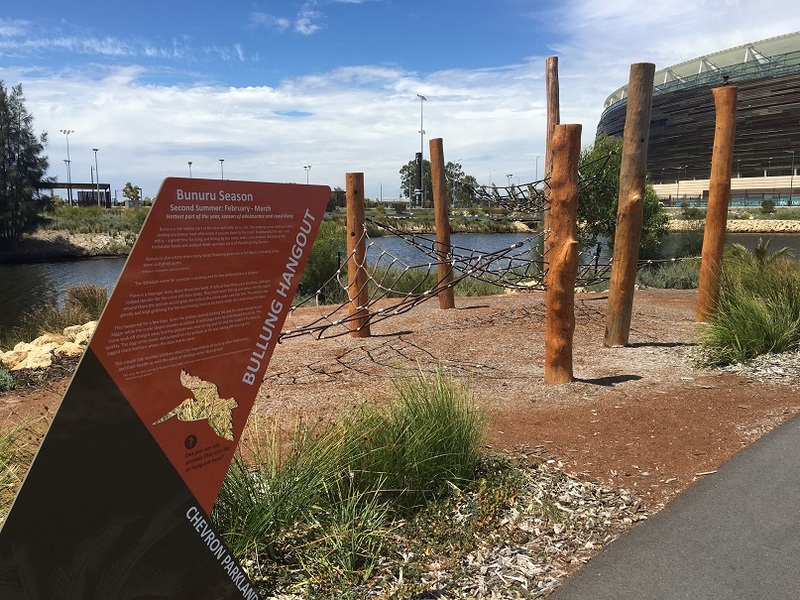 Look out over the beautiful Swan River and up to the amazing Optus Stadium from these lookouts. 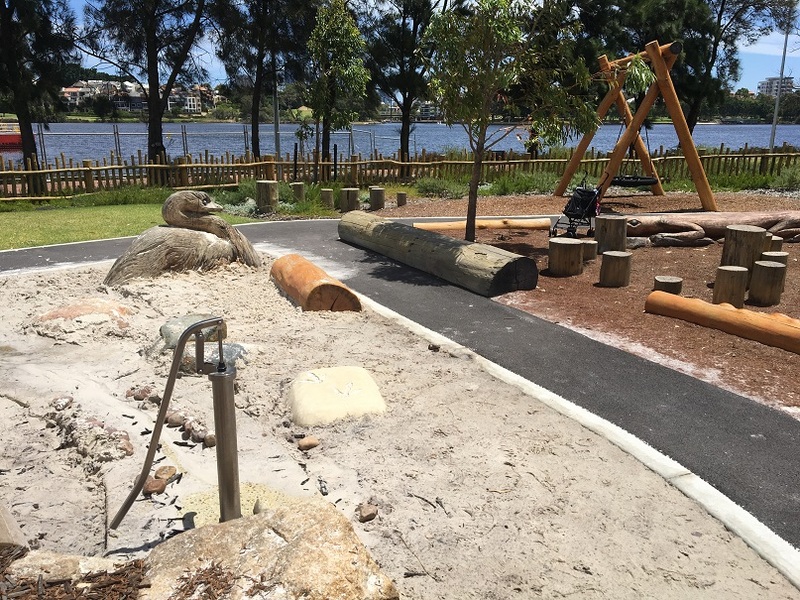 There are also some rope obstacle courses on the Swan River side of this play area. Alongside the river fed lake, right alongside the edge is the Bullung Hangout. 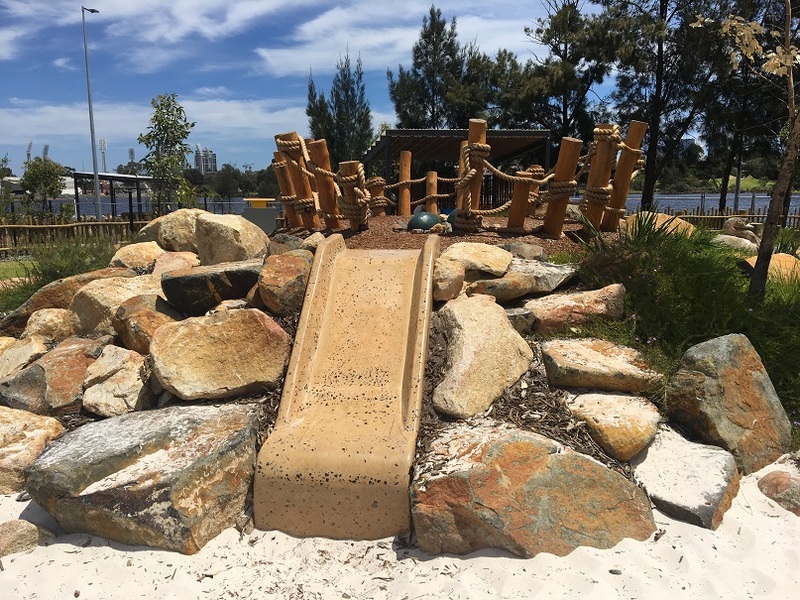 There is plenty of vegetation between the play area and the edge of the water to make getting to the edge difficult, but it is near a water's edge so please supervise children closely here. There are also a couple of musical instrument here. 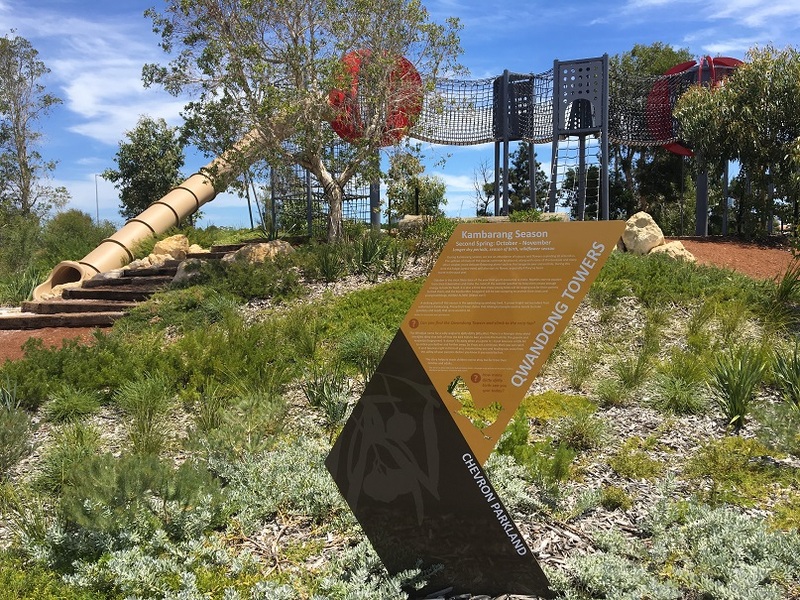 Numbat burrows features a series of concrete tunnels and structures with woven material over them that you can either crawl through or climb over. As the name suggests this play area is essentially a dried up creek bed (may be a little different after rain). Kids can frolic amongst the logs and rocks here. 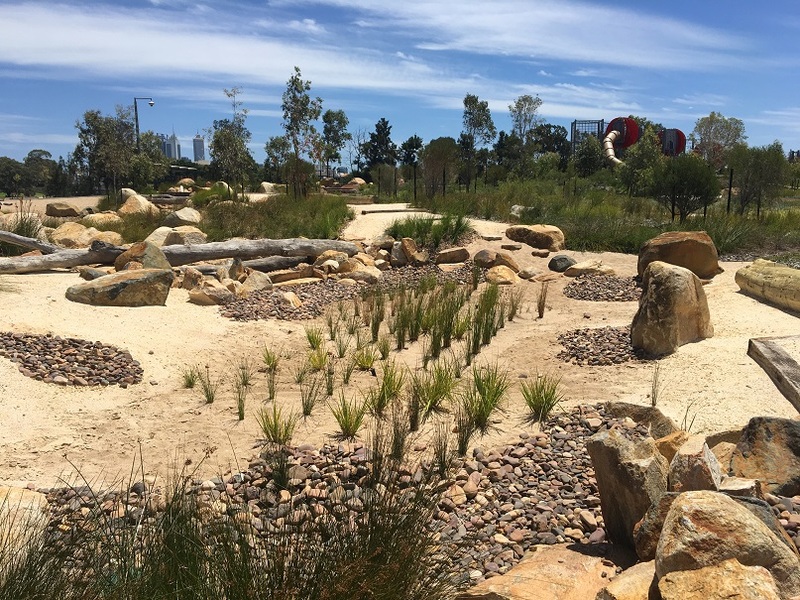 We recommend visiting Chevron Parkland on a mild day as it can get pretty hot. While lots of vegetation and some mature trees have been planted there isn't much shade and it was quite hot when we visited and it was only around 28 degrees. Bring plenty of suncream and wear a hat. A couple of water fountains are available but bring water along as it's a bit of a walk between each play area and in between drink fountains. 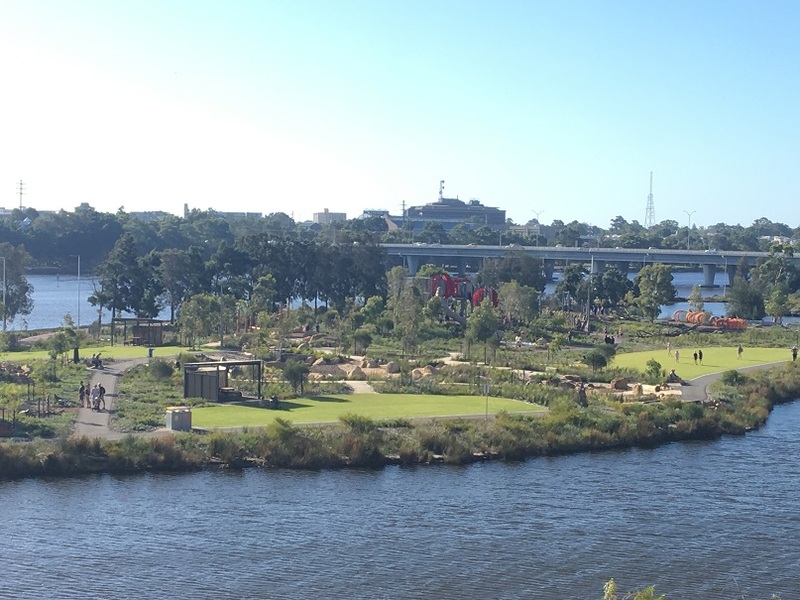 Bring bikes and scooters along, there are plenty of shared paths along the Swan River and around the parkland. 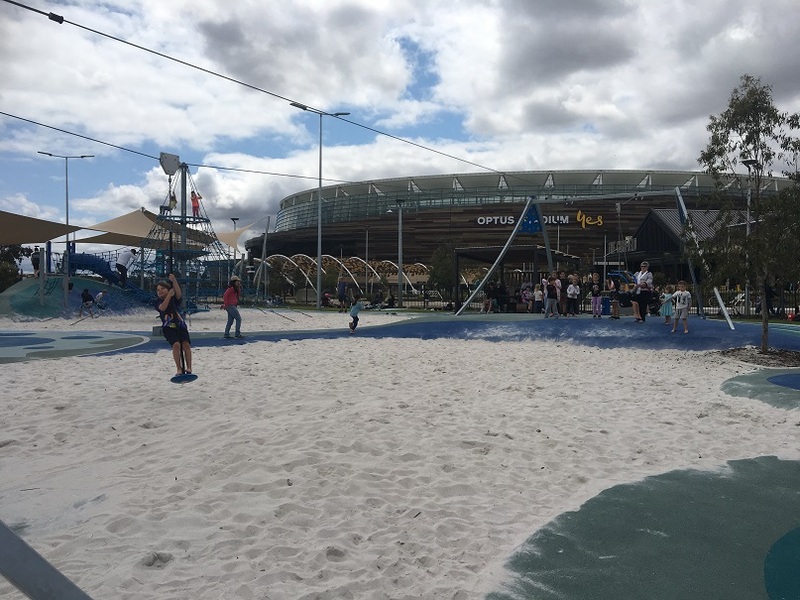 Separate from Chevron Parkland and close to the carpark and The Camfield Pub is the fully fenced Optus Stadium Sensory Playground that includes a flying fox, basketball ring, sand play, slide, trampolines and more. You can park in the Optus Stadium carpark found off Roger Mackay Drive on non event days. 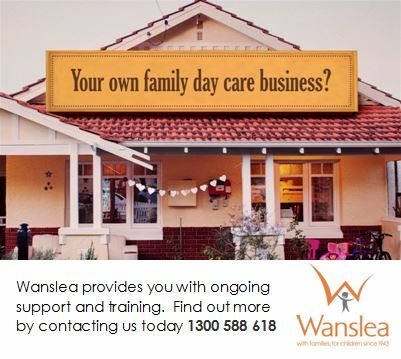 On event days you will need to park at Burswood and ride or walk up to the playground. This is a fun way to combine a walk or ride with your park play too. 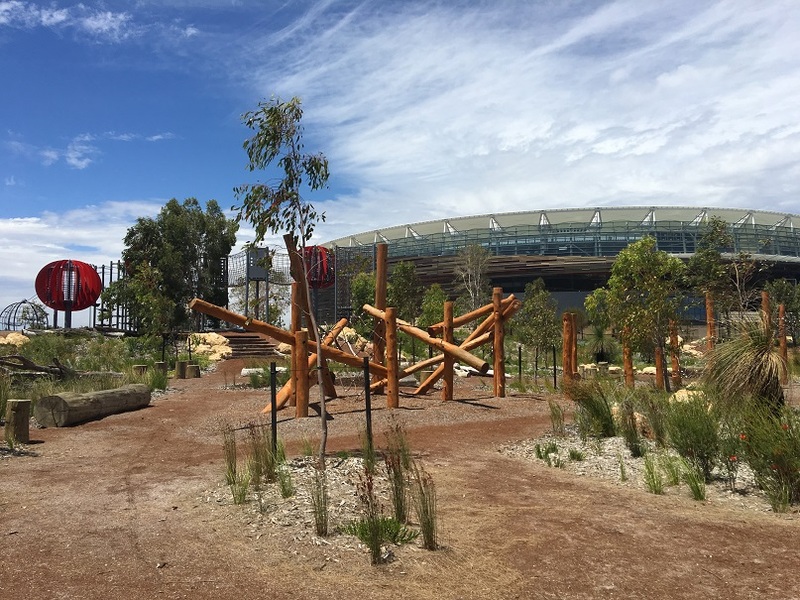 Plenty of BBQs and picnic shelters are available, plus public toilets are located outside Optus Stadium. This is a bit of a hike from the playground so may be a good idea to go to the toilets after you've parked before walking down to the playground.